There have been several different varieties in the past of these Cadbury biscuits, and the latest edition are these Wispa ones. They come in smart packaging that mimics the design of the chocolate bar’s wrapper. I do like a Wispa bar, and a Wispa Gold, bubbly chocolate does have a lovely texture to eat. The problem for me is that Wispa, although a fab chocolate bar is just chocolate. It is all about the texture, not the flavour. With a biscuit, surely all the bubbly texture is lost with the crunch? Well, I guess I was going to find out. There are eight biscuits in the pack, all quite spaced out with a plastic tray. I broke one of the biscuits in half and found that there was a decent amount of Wispa inside, hopefully enough to shine through. The coating of chocolate looked generous too, so I knew these would be a chocolatey treat. The Wispa in the centre is nice, the aerated chocolate means that the centre has give in it when you bite in, a solid lump of chocolate would have been a bit hard going on the teeth in conjunction with the biscuit. The pleasure of the bubbles was, as suspected, a bit lost. 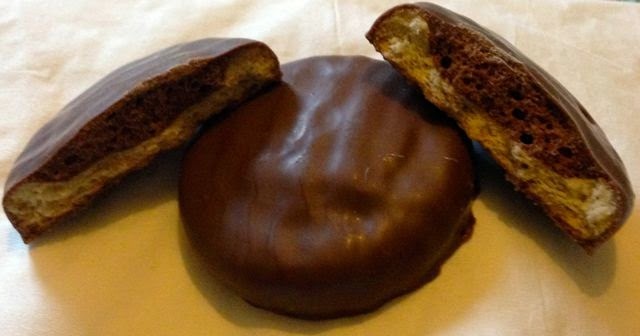 The chocolate however is the usual good quality sweet treat and the biscuit had a nice buttery taste. These biscuits are nice, they are full of chocolate and tasted rather good. Offering these out as an afternoon treat with a coffee and nobody would complain, but they probably wouldn’t ask what they were either unfortunately. They weren’t an outstanding new flavour development, they are just a good addition to the Cadbury biscuit range and a nice chocolate biscuit. Here is hoping that they releases a Wispa Gold Edition shortly too, now they could be amazing.